김명숙, 송미순,(2015).동사섭 훈련 적용 자기관리프로그램이 고혈압 노인의 자기효능감, 자아존중감, 자기관리행위 및 혈압에 미치는 효과.대한간호과학회지,45(4),576-586. Purpose: The purpose of this study was to develop a self-management program applying Dongsasub training based on self-efficacy theory, and to verify the program effectiveness on self-esteem as well as self-efficacy, self-management behaviors, and blood pressure. Methods: The study design was a non-equivalent, pre-post controlled quasi-experiment study. Thirty-eight patients aged 65 and older from a senior welfare center in Seoul participated in this study (20 patients in the experimental group and 18 patients in the control group). The self-management program applying Dongsasub training consisted of eight sessions. After development was complete the program was used with the experimental group. Outcome variables included self-efficacy, self-esteem, self-management behaviors measured by questionnaires, and blood pressure measured by electronic manometer. Results: Self-efficacy (t=2.42, p =.021), self-esteem (t=2.57, p =.014) and self-management behaviors (t=2.21, p =.034) were significantly higher and systolic blood pressure (t=-2.14, p =.040) was significantly lower in the experimental group compared to the control group. However, diastolic blood pressure (t=-.85, p =.400) was not significantly different between the two groups. 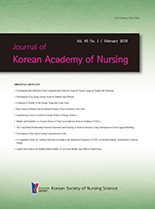 Conclusion: The results indicate that the self-management program applying Dongsasub training can be used as a nursing intervention in community settings for improving self-management behaviors for older adults with hypertension.